The fifteenth entry in Square Enix's flagship RPG franchise, set in a world that mixes elements of modern technology with magic, a fantasy based on reality. Final Fantasy XV is developed by Square-Enix and was originally intended to be part of the company's Fabula Nova Crystallis project. Originally revealed as a PlayStation 3 exclusive entitled Final Fantasy Versus XIII, it was later re-announced during E3 2013 that its name had changed, and it had become the next game in the core Final Fantasy franchise. It was released worldwide for both the PlayStation 4 and Xbox One on November 29, 2016. The story revolves around a prince, Noctis Lucis Caelum, who is the heir to the throne of the Kingdom of Lucis. Lucis has become more modernized than other nations, to the point where it resembles a contemporary city of modern Earth. It has isolated itself from the world in the process. The game's setting involves a war between Lucis and another nation called Niflheim as they fight for control of the world's last crystal, which Lucis possesses. The game begins after the end of a long cold war between warring nations and the world's crystals are involved in these conflicts in some way. Most of Noctis's party consists of his childhood friends: Ignis Stupeo Scientia, a strategist for the royal family who fights with daggers, Gladiolus Amicitia, a bodyguard of the royal family who fights with a giant greatsword, and Prompto Argentum, a foreign fugitive who wields firearms, despite their illegal status in Lucis. Other characters will join and leave the party as the story progresses. When a characters HP reaches zero they enter a downed state, their maximum HP ceiling decreasing until they are healed. When a character's maximum HP hits zero they are considered to be fallen and can only be revived with a Phoenix Down. Noctis has a chance to revive himself in this state via a time freeze, allowing the player to continue play as long as they have a revival item in their inventory. Once Noctis dies and cannot be revived, the game is over. The primary mode of travel around the game's world is a luxury car called the Regalia. There is much to see off-road however, and the player must rely on traveling by foot or by chocobo to explore the deeper world. The player is able to drive the car manually, or can set driving to automatic. When driving being automatically controlled by the game, the player can still stop to look around the world for secrets and even buy and sell items. The Regalia also features a music player featuring original tunes, songs from Kingsglaive and Brotherhood, and even soundtracks from the entire Final Fantasy series which can be purchased at shops in-game. Final Fantasy XV was first announced under the name of Final Fantasy Versus XIII in 2006. Helmed by Tetsuya Nomura, the intent was to create an action RPG in the vein of Kingdom Hearts, but with a more mature tone and story. The game's title "Versus XIII" was meant to reference a number of elements, such as the game's darker tone and setting that play in opposition to the tone and setting of Final Fantasy XIII. Versus XIII was developed as a part of the Fabula Nova Crystallis project, along with Final Fantasy XIII and Final Fantasy Type-0 (originally entitled Final Fantasy Agito XIII), and shares elements of the same fictional mythology from which the other games take their own. After years of protracted development, Square Enix unveiled a new trailer for Versus XIII at E3 2013, where it was first revealed that the game had become Final Fantasy XV. The following year, at TGS 2014, Square Enix announced that Nomura had shifted off of the project to focus on Kingdom Hearts III, and that Final Fantasy Type-0 director Hajime Tabata is now overseeing the game's development. Tabata originally joined the Final Fantasy XV team as co-director in 2012, after which the game began its transition from Versus XIII to XV and development was moved to newer console platforms. Additionally, the three core gameplay, engine, and cinematics teams that had been working separately on Versus XIII, were merged for better collaboration. As of TGS 2014, the Final Fantasy XV team was around three hundred people. The game is running on Square Enix's Luminous Studio graphics engine. The demo will be using version 1.5 of the engine, while the final game will be using version 2.0 of the engine. It will be running at 1080p with 30 frames per second. Compared to the 20,000 polygons used for the Final Fantasy XIII characters, Final Fantasy XV will be using 100,000 polygons for its characters (around the same as The Order: 1886, Uncharted 4, and Star Citizen, but slightly less than Ninja Gaiden 3: Razor's Edge and inFamous: Second Son). Overall, Final Fantasy XV will be using 5 million polygons per frame, pushing 150 million polygons per second. [ref] This is one of the highest polygon counts known for a video game. According to DualShockers, the size of Final Fantasy XV's open world could be up to 600 square kilometers, larger than the worlds of Skyrim (37 square kilometers), Grand Theft Auto V (250 square kilometers), and Xenoblade (400 square kilometers), though smaller than the world of Xenoblade X (2000 square kilometers). The Final Fantasy XV: Episode Duscae demo will cover 3 square kilometers, a small part of the Duscae region. Vouchers for a Final Fantasy XV demo were included with purchases of Final Fantasy Type-0 HD when the game was released on March 17, 2015. 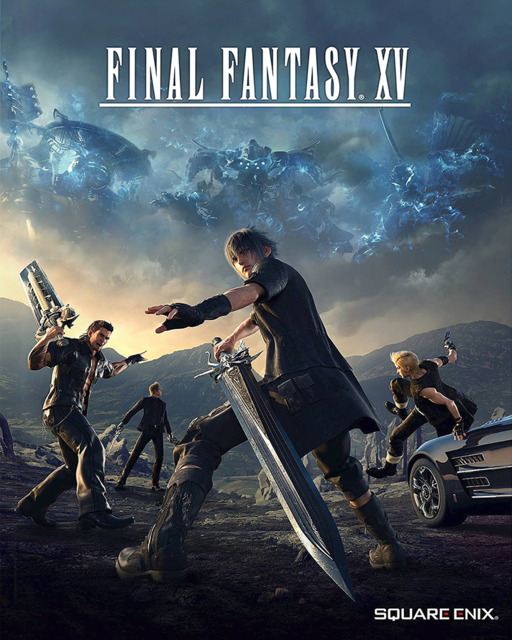 The demo released on March 20, 2015 called Final Fantasy XV: Episode Duscae. The demo is taken from an early portion of the full game with some differences; the name "Duscae" is taken from a location in the game's world. The developers were aiming to allow the demo to be completed in an hour, but it could contain enough optional content to explore to extend to three hours. Another demo, Platinum Demo - Final Fantasy XV, was released on March 31, 2016 following the Uncovered: Final Fantasy XV event. The demo contains content that isn't in the main game and follows a young Noctis as he journeys through a dream. E3 2016: How Long Will Sean Bean Survive in Kingsglaive: Final Fantasy XV?